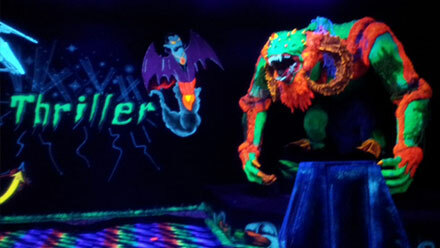 With 18 holes, the hottest soundtrack, the coolest glow in the dark effects, and the creepiest creatures to crawl out of the underwold, you are sure to have a blast at our indoor Thriller Mini-Golf! Thriller opens at Noon so come play now! 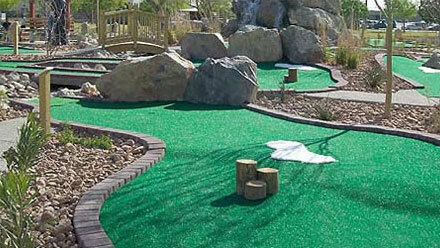 Our mini-golf course is popular for group activities and dates. We have an 18-hole course for a full round, or a 9-hole course for a quicker game. Perfect for all ages. Bring your family and play a round today!